The date was 7 September, 2012, a mild Friday autumn evening and Glasgow Warriors had just finished their first league match in their brand new facility at Scotstoun. It was a loss, their second in succession, away to Ulster and at home to the Scarlets. In the post-match press conference, the new club coach Gregor Townsend looked like he might be physically ill. He had just taken the Warriors’ reins from Sean Lineen and losing his first two matches in charge was not part of Townsend’s grand plan. Thankfully his coaching career took an upward trajectory from that point, with the club finishing third in his opening season and second in his second before winning the Guinness Pro12 in style at the third time of asking, the first tangible success for any Scottish pro team. Had he done nothing else, Townsend would get my backing for another Glasgow performance long before that Belfast final. Having witnessed the Scottish pro teams get their backsides felt by Munster over the years the Warriors didn’t just beat them at Scotstoun in March 2013, they clinically dismembered the former European giants, running six tries past them. If the Gala man has sometimes seemed to live a charmed life, and being appointed Scotland head coach at the age of 43 is sorcery of sorts, he has had his share of disappointments. Being placed on the international scrapheap by Matt Williams at the age of 30 was a bitter pill to swallow and his first time round the houses with the Scotland squad, as Andy Robinson’s assistant, didn’t earn him much beyond brickbats from the press gallery, although the experience will have stood him in good stead. Back then the Scotland team were a little lacking in stardust, but these days an exciting back line and a competitive pack of forwards should make life a little easier for Townsend when he takes over from Vern Cotter as national head coach next summer, not that his former mentor harbours any doubts about his abilities. “Gregor has a great understanding of the game,” says Robinson, who gave Townsend his first big break in coaching. “The key thing is his knowledge gleaned from playing at ten, twelve and even fifteen. “Secondly, Gregor has an ability to communicate clearly and concisely in a way that the players can take on board even under the greatest of pressure. He handles the pressure and still makes good decisions while remaining true to his principles. That Townsend was destined to coach Scotland was taken as red; that he was got the job so early was a surprise. Some have taken it as a sign of desperation that SRU chief executive Mark Dodson was forced to offer Townsend the crown jewels just to keep him in Scotland, but rumours suggest that Townsend campaigned vigorously for the post rather than taking a job in the Top 14 where, with the help of an top-class conditioning coach, he could have had a revolutionary impact in a league that is more traditional than Borders rugby. That he chose not to suggests he learnt a lesson from his predecessor at Glasgow – Sean Lineen was long touted for the top job – and decided that if he didn’t cash in while his stock was high he may not get the opportunity at all. Not that Townsend questions his own abilities. If he suffers sleepless nights it isn’t because his soul is tormented by self-doubt. It may also hint at one other interesting aspect. While coaching Scotland may be the pinnacle of most coaches’ careers, at least those who were born and bred north of Berwick, it is entirely possible that Townsend sees it as another step on the ladder towards coaching at the very apex of the game: the British and Irish Lions. After numerous foreigners have filled the post, the Lions bufties who decide these things would be delighted to appoint a home-grown coach and especially one with a pedigree like Townsend, whose high watermark was playing a controlled and disciplined part in the victorious tour to South Africa back in 1997. Critics will still carp that club rugby isn’t like the international game and argue especially that transposing Glasgow’s high-tempo, high-risk strategy on to the Six Nations stage would be suicidal. But Robinson argues that Townsend will be well aware of those pitfalls. “My decision with Gregor was that he had to go back and coach a club and make all those mistakes which are inevitable for any coach, everyone makes them,” says the current Bristol boss. “I think he has the drive and the skill set to be a very successful Scotland coach. It’s far from clear that that was the case, as the news seems to have taken Cotter by surprise as much as anyone else. While the rugby results have been improving, after that whitewash on Cotter’s Six Nations’ debut, the Kiwi wasn’t one for building political alliances behind closed doors and that failure may have undermined Cotter’s claims to take this Scotland squad to the 2019 World Cup after a very decent showing at last year’s tournament. The future for Cotter is unclear, but a return to New Zealand seems less likely than a return to the Top 14, which remains the Kiwi’s spiritual home and scene of his biggest success. Meanwhile, the future for Townsend is equally opaque. 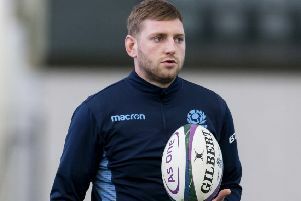 Should he make a success of the job in hand, then he will want to emulate Ian McGeechan who, despite a stellar playing career, became better known as an international coach who squeezed the best out of his teams, at least when he had Jim Telfer working alongside him. And that is the last piece of the jigsaw because Townsend won’t manage much on his own. He needs a forwards coach grounded in the nuts and bolts of the game, a set piece expert, to act as a philosophical counterweight to his own obvious desire to see his teams play with the ball in hand. With the strongest playing squad in a generation, his choice of running mate will likely determine Townsend’s immediate future... and that of Scotland.